We’ve all been there: you buy a product online or inquire about information, fill out a form, hit ‘Submit.’ And then….the thank you page. They can be so mundane that they’re not only overlooked, but often disregarded completely. If someone has filled out a form on your website, they’re interested in what you have to offer - and you have a full page to help guide them to what comes next. This is a lead we’re talking about. Why let the opportunity for continued lead nurturing go to waste? Here are 4 easy ways to help you fully customize your thank you pages. Tell them (clearly and concisely) what to expect next. 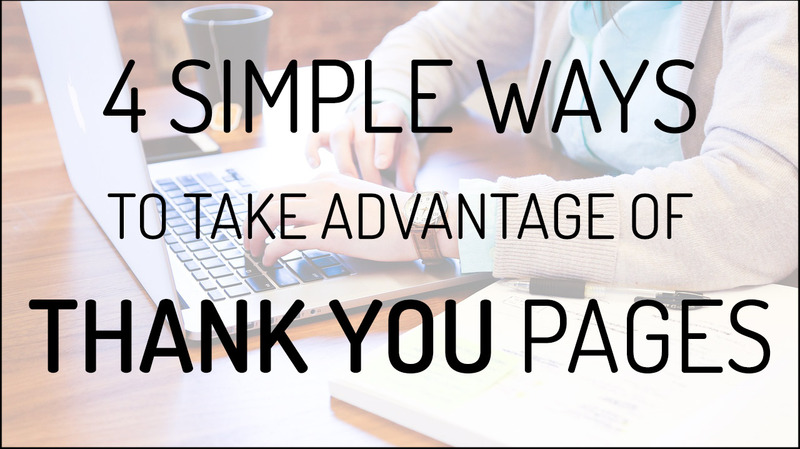 More often than not, thank you pages simply say those two words: “thank you.” Instead of a generic message, use this page to your advantage to capture your lead’s attention and help direct them to the next step. Thank them for submitting the form, explain how and when they will receive what they signed up for, and add a time frame. Let them know there is an actual human on the other end of this process who will be helping them in real-time. BONUS: Add a call-to-action! If you want to continue the conversation, this is the perfect place for a well-crafted CTA. Make it bold, engaging, and enticing enough for your lead to want to click. It could be anything from “Learn About Us” to “Our Community Involvement.” Whatever it is you do, make people want to continue reading about it. Suggest they sign up for your newsletter or blog. The person that has arrived at your thank you page got there because they want to know about what you’re offering, so instead of stopping cold, usher them to learn more. A quick and easy way to do this is by providing an option to sign up for your newsletter or blog. It can be as simple as a singular field for them to enter their email address. Tell them why they should subscribe, the type of information they will receive, and how it will benefit them. Encourage them to follow you on social media. There is no truly better way to connect with leads than by showing off your company’s personality through social media. You know if someone is filling out an online form, there is a good chance they have at least one social media account. Offer well-designed buttons linking to directly to your business’ social pages. Show prospective leads what you’re all about and, most importantly, stay connected. Take the opportunity to show off your best content. I’ve said it once and I’ll say it again - this is a (primarily) blank page we have to work with! Provide additional relevant articles or site pages for leads to check out. Be sure to include featured images, blog titles, and links directly to where they need to go. Even better, do some research on the pages or blogs that have the most traffic and guide your leads to them. They’re successful for a reason! BONUS: Add a video. Have an informational video about your company’s philosophy? Perfect. What about a testimonial video featuring long-time, happy customers? Even better. Videos that are high-quality, perfectly bite-size, and help the client learn more about your company can only benefit you. Plus, video has been known to boost conversion rates, so adding one to an unexpected page can’t hurt! There you have it, folks - the art of a high-quality thank you page. Don’t let those bland pages go to waste any longer! For more about how you can best utilize the content on your website, contact us at Page One today.